Mangaluru, Sept. 03, 2015: A person from Tamil Nadu arrested in connection with burglary of Nine Lakhs from the ticket counter of Mangalore central railway station on September 2, 2015. The culprit is identified as Madhusudanan aged 39, hailing from Thiruchirappilli, Rajaji Nagar in Tamil Nadu. He was arrested from Goa by the Railway Security Police (RPAF). 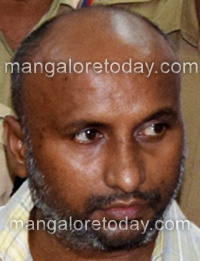 Madhusudanan was arrested in a Bank robbery and was produced in the court. Preliminary investigations proved that he was part of a bigger gang of thieves who have been involved in many burglaries. The RPAF took him to custody from the court for investigation. The police are on the look- out of the rest of the gang members. It may be recalled here that the burglary at Mangalore Central ticket counter had come to light on July 19, 2015. The theft happened during time gap when the Railway Counter Cashier Sunil had gone for lunch in the afternoon on July 19, 2015. RPAF was able to nab the culprit with the help of the CCTV images recorded on the day of incident. Was the railway counter open to all, that any one can enter so easily? The police has done a great job by arresting the criminal, he will guide the police to find the others involved in the case. Why cant the people earn their living by working instead of stealing? Knowing the consequences they involve in the case and get arrested by the police.